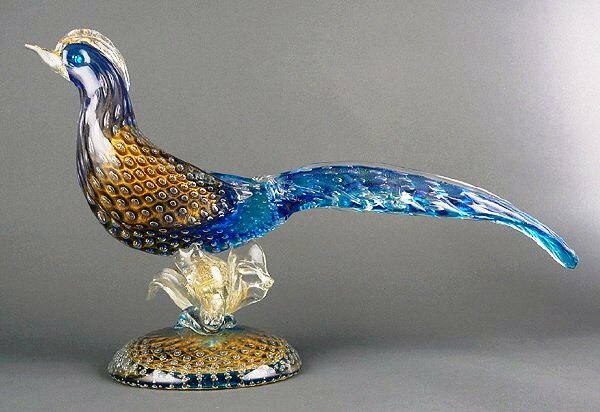 This Venetian Murano pheasant (circa 1960) measures 19 inches long and stands about 10 inches tall. Comparable examples by unknown artists sel in the $150 to $300 range. Murano glass has a very long history. In 1292, an ordinance was passed in the city of Venice that banished glass making to the island of Murano in the Venetian lagoon. According to some historians, the reason was partly to protect other buildings from fires (which commonly started in glass works; the Great Fire of London is believed to have started in a glass works), and partly to retain a lock on the decorative glass trade. It was even forbidden to teach foreigners the trade secrets of glass making, and the threat of the death penalty was used to keep glass monopolies’ secrets on Murano. Many of the modern Venetian Murano sculptures we see today are post-World War Two examples, and most are not signed, using a generic foil label that rarely survives the first washing, or are often removed after sale. There are many famous makers of decorative glass ware in Murano, such as Toso, Dino Martens, Salviati and others, but without a label it is difficult to attribute any one maker to items of this type without extra information, such as a provenance or bill of sale. In the current market values for Murano glass sculptures varies widely, as the quality of these pieces goes from almost dreadful to unbelievable works of the glass makers art. In the case of the bird sculptures, it is possible to pick up at auction a low quality “paper weight”-sized bird for less than $20, while good quality birds measuring 10 inches or longer selling in the $50 to $80 range. The Murano pheasant above is a very nice example (circa 1960) by an unknown maker, measuring 19 inches long and standing about 10 inches tall. Comparable examples often have presale estimates in the $150 to $300 range. This one was a bargain, with a purchase price of $200.